On any given day last school year, 4 percent more — or 475,000 — students received breakfast at school, as part of the national School Breakfast Program, than did students in previous years. And almost 9 in 10 of those students got their breakfast free of charge or at a reduced price. This is important because these are students who would likely go without breakfast if it weren’t available in school. 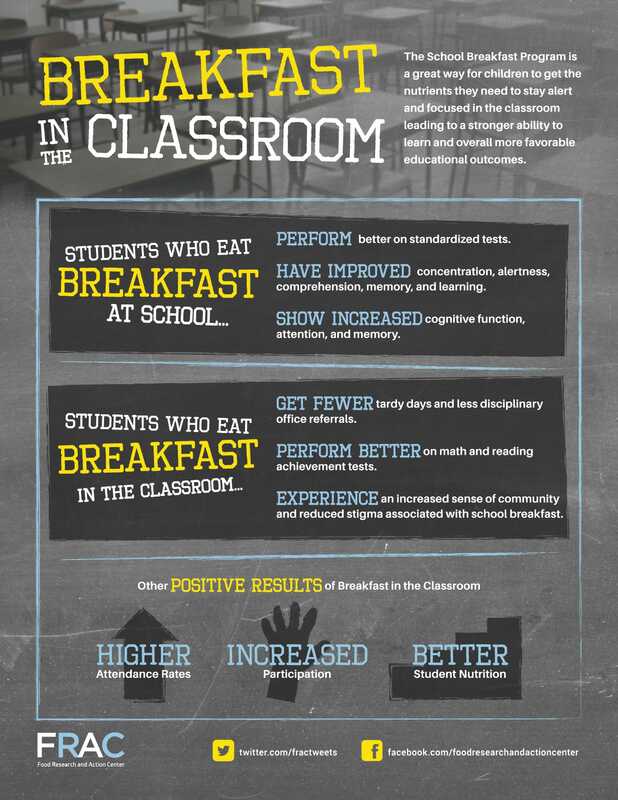 And we all know that having a full stomach in the morning can lead to better focus and behavior in class. It’s National School Breakfast Week, a campaign to raise awareness of the national School Breakfast Program (now in its 50th year) and its importance for overall student health and academic achievement. Since updated standards took effect in 2013-14, all school breakfasts include a serving of fruit, whole grains, and low-fat or fat-free milk. The Food Research & Action Center put together this interactive map, which breaks out by state the total number of low-income students participating, the number of schools offering school breakfast, and the additional federal funding states would receive if more schools were involved. See how your state fares, and join the conversation on Twitter using #NSBW16.